Sometimes the hardest part about getting help when you’re with an abuser is recognizing that you’re with one to begin with. “Many survivors don’t realize they’re in an abusive situation. 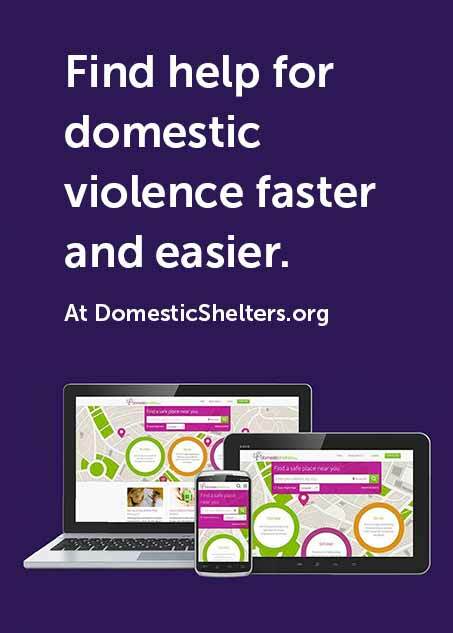 Domestic violence is not just physical or sexual abuse— it’s any form of power and control,” says Yvette Lozano, director of intervention and emergency services with the nonprofit Peace Over Violence. Amy Thomson told DomesticShelters.org in her survivor story that she initially wrote off her boyfriend's unexpected outbursts of anger early in their relationship. "We all have those days," she says. But over the course of their six-year relationship, things escalated and Thomson narrowly escaped with her life. Survivor Jennifer told a similar story—her boyfriend at 17 came from a troubled background. He abused alcohol and snapped angrily at everyone. He put Jennifer down every chance he could. She talked herself out of it and married him anyway. Her abuser ended up breaking her cheekbone in an argument. Feeling like you’re being controlled. This could include your partner telling you how to dress, who you can see or talk to, whether or not you can have a job, or your partner is restricting your access to money. Feeling fearful that your partner might physically abuse you. Having a partner with a pattern of low self-esteem or who expresses feelings of inadequacy or powerlessness. A sense that your partner is objectifying you, treating you more like his or her property than an equal partner. Having a partner who constantly blames their outbursts, anger or controlling behavior on external circumstances—a stressful job, family drama, drinking too much or just having a bad day. Having your partner who threatens to leave or take your children away from you. A general sense of feeling on edge or not feeling safe. Noticing your partner is "overly kind" outside the home with friends, family or coworkers, and changes into a more threatening person with you behind closed doors. What do you do if you recognize any of these signs in a loved one’s partner? The most important thing to do is not tell the victim what to do, says Lozano. “By telling them what to do, we’re transferring that power to ourselves. We need to build back up their self-esteem.” Instead, offer up information to the victim about resources that are available to help them. Many victims feel like they’re the only ones going through an abusive relationship, and that there’s nowhere to turn, says Lozano. Give them information about shelters, counseling services and advocate agencies that can help them escape. Most importantly, Lozano says, “Let them know they do not deserve to be in this unhealthy relationship.” For more tips, read, "My Friend Told Me She's Being Abused."